Please: Don’t spruce up built heritage but preserve it as an authentic historic document! Ce chapitre récent de l'histoire de la conservation-restauration peut illustrer le progrès de la conservation du patrimoine bâti en Allemagne durant les années 70. Celui-ci se caractérise par un changement de paradigme, une amélioration qualitative en termes de théorie et de méthodologie, en raison d'une meilleure situation légale et de l'extension du concept de monument historique, en ce compris compris des exemples aussi modestes que des habitations domestiques et des fermes. This recent chapter of conservation history can illustrate the improvement in the preservation of built heritage in Germany in the 70s. It was characterized by a paradigm change, with a remarkable increase of quality in theory and methodology, due to a better legal situation and to a broader concept of historical monument, including also modest examples of dwellings and farmhouses. I would like to thank Roger Skarsten (HAWK University of Applied Sciences and Arts, Hildesheim) for revising my English. I would also like to thank the institutions, which provided me with historical photos: Bayerisches Landesamt für Denkmalpflege, Dr. Hundemer; Niedersächsisches Landesamt für Denkmalpflege, Prof. Dr. Stadlbauer. 1With this contribution to the publication in honour of Roger Marijnissen, I should like to emphasize the importance of interdisciplinary cooperation in the research and preservation of cultural heritage. I focus on a recent chapter in the history of conservation and restoration of built heritage and survey the German situation in the 70s, with the methodological and technical developments in the investigation and documentation of historical buildings and architectural surfaces, especially in Bavaria. 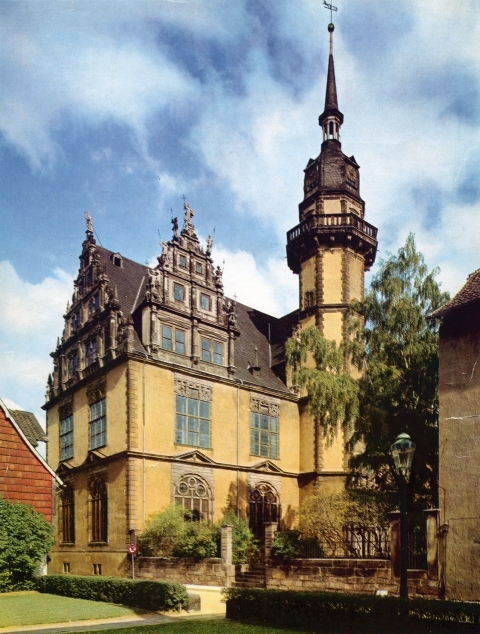 2In the course of the 70s, the German Länder passed modern laws for the protection of historic monuments and sites, in answer to the heavy damages and losses of historic buildings and urban structures in towns and villages as a result of the building boom after the Second World War. This intervention in favour of safeguarding built heritage and ensembles was much-needed. In various historic town centres untouched by the destruction of war, government-funded programmes of town planning defined so-called remediation areas for the renovation and modernisation of historic urban districts. In most cases, these interventions were a synonym for demolition. In these areas, only a few historic buildings – those considered the most representative – were restored. 4This process of democratisation was able to dissolve hierarchical structures between so-called major monuments and minor monuments, leading to a definition of historic monuments that considers the context of people’s lives in the past and present, with their social and urban values. The traditional appreciation of a monument primarily based on artistic and historic values shifted more and more into the background [Sauerländer 1975]. 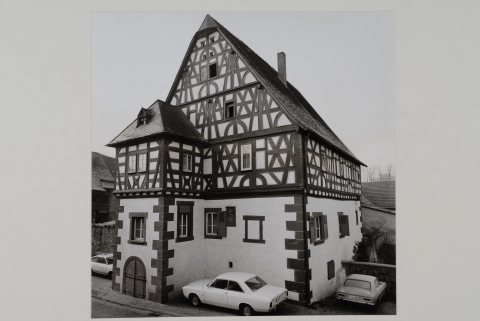 5In the course of the 70s, modest historical dwellings and farmhouses were included in the inventories of built heritage and in the listed buildings as well as in the practice of preservation and conservation. This brought an essential enhancement of the tasks and duties in the field of preservation of built heritage – not only because the greatly increased number of listed buildings. Professionals distanced themselves from a museum-like concept of heritage preservation, considering more and more the requests and ideas of the users and trying to incorporate historical buildings into contemporary life. But there was also a new empathy with the complex historical values of built heritage. Instead of designing historical buildings according to the prevailing taste of the current time – a widespread concept of architects active in the field of heritage preservation at mid-century – it became imperative as pre-condition for every kind of intervention to conduct a scholarly-based historic study of the monument with all tangible documents of its different building phases [Petzet 1975]. 6For the conservators a new field of activities opened up. Not only the important and generally accepted works of art but entire historical buildings with their architectural surfaces and their fittings had to be recorded, conserved and restored. This included also modest historical documents of artistic design and traditional crafts, which up to that time had not been considered worthily of preservation, such as plaster, stucco, paint layers, polychromy and simple decorative paintings on architectural surfaces, as well as floorings and wooden fittings such as doors, windows, panelling and so on. In interdisciplinary cooperation among conservators, architects and art historians active in the field of heritage preservation, the new tasks of conservation led to a paradigm change. Historical architectural surfaces should no longer be renewed, as was routine in the past, but instead analysed in the context of the monument’s history, recorded and conserved. 7It was a great challenge to develop appropriate methods and techniques and to find professionals able to perform them in everyday practice. Therefore it is useful to have a look at the professional education and training of conservators in the field oft built heritage preservation at this time. 8In the German tradition, the majority of conservators working in the field of heritage preservation were skilled craftsmen. In contrast to many conservators of easel paintings active in museums and galleries, they did not study at academies of fine arts where courses in historical painting techniques were part of the study programme. At best they had finished a craftsman apprenticeship as traditional “church painters” (Kirchenmaler) who specialized in renewing architectural surfaces with different techniques of whitewash, paint, polychromy, gilding and so on. In the practice of heritage preservation after the Second World War, this education was perfectly appropriate, because the conservator’s job indeed was not conserving but rather renewing the architectural surfaces in churches and the design of historic facades. The supervisors responsible for this work operated on the premise of shaping and designing a historic monument in the supposed form of the original appearance, but in fact they were bound to the taste of the current time. The knowledge of the “original” was based on rudimentary methods of investigation, done by scratching and partially uncovering the oldest historic surface, often mixing together other wash and paint layers of the stratigraphy, meanwhile removing and destroying later historic layers. With such methods it was rather impossible to understand and reconstruct the characteristics of sophisticated historical techniques of architectural surface design. As a result misinterpreting historical findings of plaster and polychromy, false or rudely simplified reconstructions of historic surfaces were produced and the appearance, for example, the interior of a baroque church was falsified. In the reports of professionals working for the authorities at that time, the word “renewal” is often used instead of “conservation” when describing activities concerning built heritage – a wrong terminology for heritage preservation as a reflection of proceedings without a clear methodology. Fig.1 Johannes Taubert, 1970 ca. 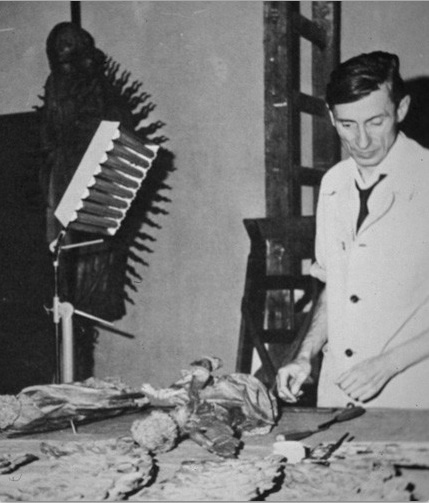 Johannes Taubert (1922-1975), Chiefs Conservatoir of the Bavarian State Departement Conservation Atelier, in a photo of 1970 ca., during the conservation work on the polychrome wooden sculpture "The annunciation", St Lorenz church in Nuremberg. Photo: Bayerisches Landesamt für Denkmalpflege. 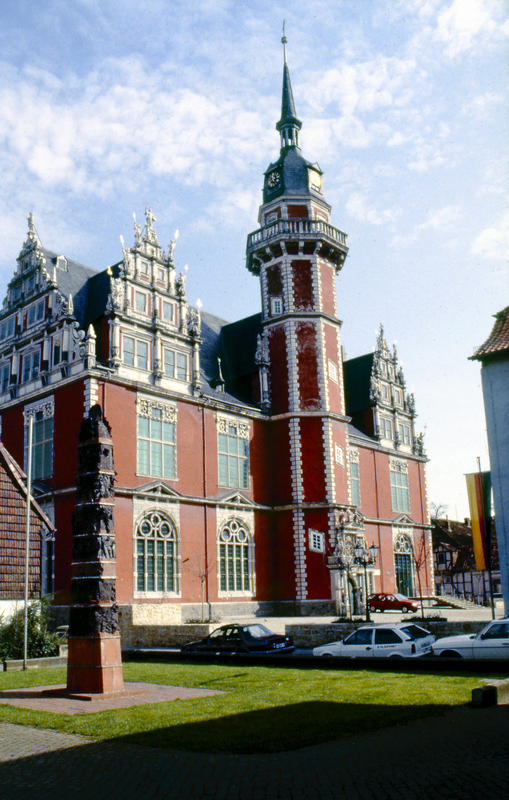 Helmstedt, former Assembly Hall of the Juleum constructed in 1592-97, with the Façade in the stone-faced appearance. Photo: Archive of Niedersächsisches Landesamt für Denkmalpflege, 1970 ca. Helmstedt (Lower Saxony), former Assembly Hall of the Juleum constructed in 1592-97, with a Façade polychromy reconstructed on the basis of analogies with Renaissance polychromy findings in Lower Saxony. Photo: Archive of Niedersächsisches Landesamt für Denkmalpflege, 1970s. 11This concept of enhancing the status of built heritage by fluctuating between an aesthetic and a scholarly historical understanding of the monument was very popular in Germany at that time. But at the same time, individual conservators were demanding clear and strong requirements for architectural paint reconstruction. One of these was Anton Ress, who carried out systematic research on architectural paint, polychromy and decorative paintings in churches and dwellings in Franconia, on the basis of stratigraphic investigation and interpretation of the findings related to the written sources [Ress 1973, pp. 195-228]. He realised that the precise knowledge of such often neglected paint and anonymous decorations is essential for a comprehensive understanding of built heritage. In the practice of conservation, Ress claimed that clear investigation results without any doubt should be a precondition for the reconstruction of historical paint or polychromy. He was very interested in the different types of paint and polychromy of half timber houses, a typical construction for historical buildings in Franconia. 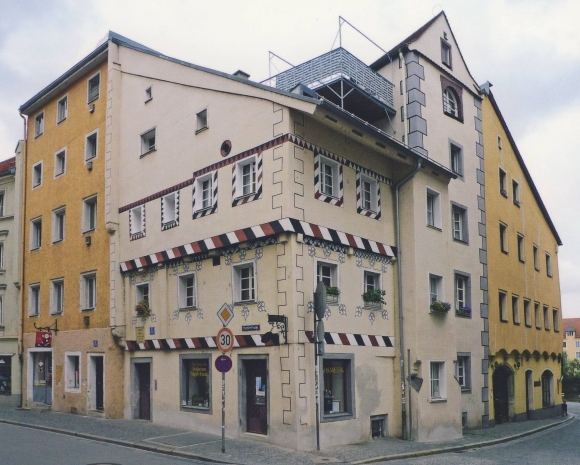 The former tollhouse in Stockstadt on the river Main, a half timber construction of the third quarter of the sixteenth century with an annex porch dated 1619, can exemplify the important results of architectural paint research. The half timber polychromy belonging to the construction phase of 1619 presented red paint on the timber, accompanied with red stripes and black lines on the white infill. In addition there were trompe-l’oeil painted timber elements in the same colours and design, to integrate the “pattern” of the facade. Ress analysed an increased ornamental understanding of architecture, to the point of a sort of horror vacui, in this historical decoration. The original paint traces were recorded and conserved and the polychromy reconstructed using historical materials and techniques – a very progressive undertaking at that time. 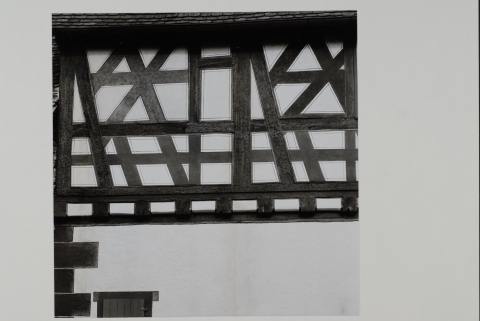 Façade of the former tollhouse, a half timber construction of the third quarter of the sixteenth century with an annex porch dated 1619, after the reconstruction of the polychromy of 1619, carried out in the late 1960s, on the basis of original findings. Photo: Bayerisches Landesamt für Denkmalpflege, 1970 ca. Façade of the former tollhouse, detail of the reconstructed polychromy, with red paint on the timber, accompanied with red stripes and black lines on the white infill; in addition, trompe-l’oeil painted timber elements in the same colours and design, to integrate the “pattern” of the façade. 12The example of the tollhouse in Stockstadt may demonstrate how the historical, cultural and aesthetic values of a modest historical building increase when the authentic paint and polychromy are still preserved, at least in fragments. These documents can bear witness to the craftsmen’s art and design and to people’s taste and way of living in the course of time. The outcome of this development was a re-evaluation and new appreciation of anonymous historical architecture, design and decoration, in the spirit of the Venice Charter of 1964, which required a well-founded study of historical findings and the commitment to preserve all tangible documents of a building’s history. 13From this it followed that in the 1970s the activity of conservators, art historians and architects with respect to the preservation of built heritage was characterized by fundamental discussions on developing a modern methodology. These discussions included how to take inventories of a wide variety of historical buildings, comprising architectural paint research and historical building research, and how to transfer this new comprehensive knowledge of the monuments into the practice of conservation and restoration. Is it possible to preserve the historical architectural surfaces in the interiors and on the facades as authentic documents in a sustainable manner, also for future generations? Can dwellers in a historical building manage to use it with respect and caution yet in accord with their way of life, their needs and requirements of today? And is it at the same time practical and ethical to present built heritage with its historical surfaces (plaster, paint, decorative painting and so on) to the users and to the public, by means of increasing sympathy and appreciation for the monument? In 1975, Saskia Durian Ress described two alternative approaches that are still best practice today, including possible compromises between the two fundamental positions: the “packed” historic building and the museum-like presentation of a historical building [Durian-Ress 1975]. In the first case, historical findings of painted and designed surfaces in interiors or on facades have to be accurately recorded and documented and then covered with different kinds of facing and reversible protective plaster or paint layers. 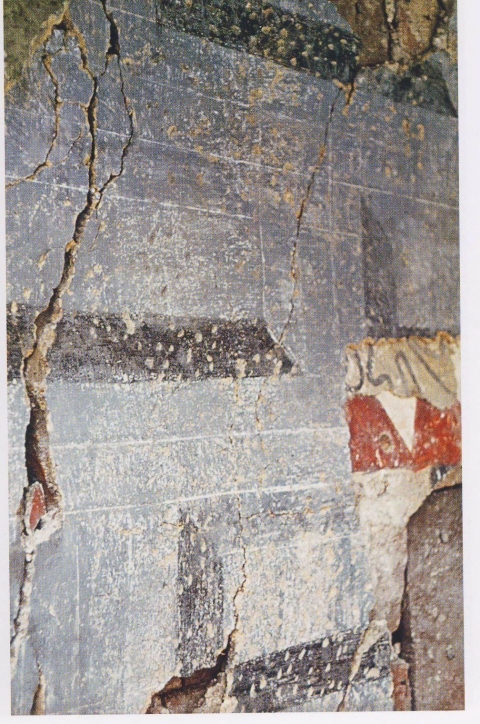 If precise and complete information on historic paint and design is provided, a reconstruction (for example, of a decorative painting) on the protective layer is possible, utilising historical materials and techniques. In this way, the historic appearance is depicted and can contribute to a better understanding of the monument, and at the same time the original findings are protected and available for future generations. In contrast, a museum-like presentation of historic surfaces can come into consideration only with appropriate preservation conditions and an appropriate use of the monument. Such kind of presentation should not be misunderstood as a sort of “analytic” restoration that provides the “preparation” of a spectrum of findings belonging to different historical phases of paint or decoration. It will rather show one historical phase of design and decoration, generally choosing the most recent one, if it is representative of the historical building in its handed-down appearance. 14In practice, the conservation of built heritage in many cases was and still is more intricate, as exemplified by an important historical building in Regensburg that was studied and restored in the 1970s with an intensive interdisciplinary cooperation between professionals with specializations in historical building research, architectural paint research, natural sciences, history and history of art [Farbige Architektur 1984, pp. 65-72; Strobel 2011]. The so-called “Kepler-Haus” received its name from the famous astronomer and mathematician Johannes Kepler, who lived with his family in this former craftsman’s house from 1626 to 1628. The building is situated in the northern part of the medieval town, near the town wall and the river Donau, was edified around 1330, and consists of a modest three-storey dwelling house connected with a five-storey dwelling tower. The upper storeys of the dwelling house are realized in half timber, with plastered facades; the dwelling tower in stone masonry, likewise with plastered facades. In the 1970s this very precious and altogether well-preserved example of a medieval building with vaulted cellars and timber rooms with planked walls and ceilings with beams and planks was threatened with demolition. Regensburg, “Kepler-Haus”, a former craftsman’s house edified around 1330, where the famous astronomer and mathematician Johannes Kepler lived with his family in 1626-1628; photo of 1972 before conservation and restoration. Photo: Bayerisches Landesamt für Denkmalpflege, 1972. 15After a long battle with many political problems, the Bavarian State Office for the Preservation of Historic Monuments and Sites managed to save the listed building and restore it. An important argument in persuading the local authorities and the public of the imperative to preserve the monument was the existence of three different historical painting layers on the façade, partially uncovered during the stratigraphic investigation of the dwelling house. These very rare examples of façade paintings are of utmost importance for the history of medieval architecture in Germany. The first façade painting, dated around 1330 [Strobel 2011, p. 23], presents a decoration of painted friezes with zigzag and rhombi in black, white and red underlining the façade structure like cornices for every storey. The windows of the first storey are decorated with painted white framework and fleur-de-lis, the windows of the second storey are framed with painted friezes with rhombi in black, white and red, and the house corner is decorated with an ashlars’ pattern. 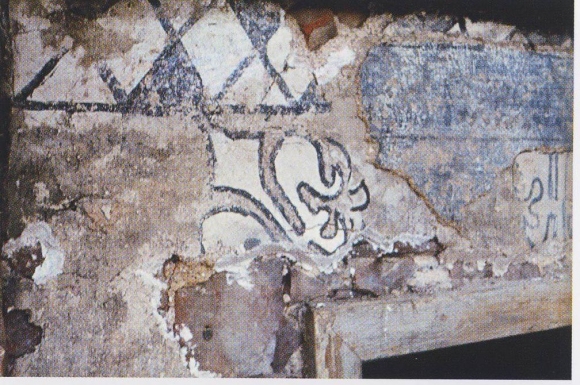 The photo shows a detail with the stratigraphy of the plaster and painting layers: the first one with a decoration of painted friezes with zigzag and rhombi dated around 1330 (a finding visible on the bottom), the second one with the motive of the fleur-de-lis just used in 1330 ca. and now applied around all the windows framework, dated around 1370 (a finding in the middle), and the third one with a grey ashlars’ pattern, dated around 1530 (a finding on the top). Photo: Bayerisches Landesamt für Denkmalpflege, 1970s. 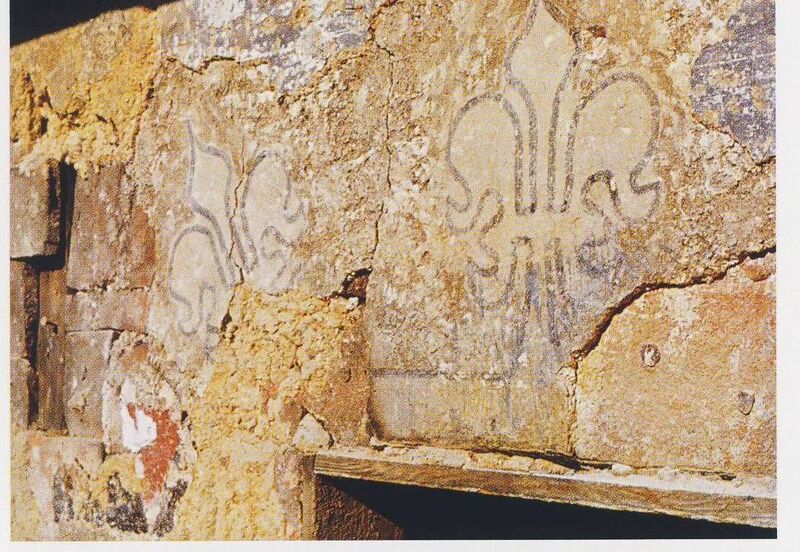 16The second façade painting, dated around 1370 [Strobel 2011, p. 23], is a more delicate variation of the first one, without the heavy friezes and with a very decorative effect of the window framework, using the motive of the fleur-de-lis overall the façade. Façade painting, details of the second decoration dated around 1370: framework with fleur-de-lis. Façade painting, detail of the third decoration dated around 1530, with a grey ashlars’ pattern. 18Starting with the conservation and restoration of the Kepler-House in the middle of the 1970s, most of the historic walls, ceilings and fittings in the interior were preserved in situ and integrated in the modern use of the building. But the conservation concept developed for the façade paintings was quite different. Instead of conserving all of the plaster and painting layers in situ and protecting them with a facing, the authorities decided to detach the entire “package” of all these historic layers (in stacco technique in different sections), transfer it onto a new support, and present it in a museum (the original idea was a presentation in the municipal museum of Regensburg). It was not a rash decision; the experts were sure that detachment was the only realistic method to save the precious and fragile façade paintings, due to the traffic vibrations around the Kepler-House and also to the need for thermal insulation of the facades. Today these problems could be addressed in another way, but in the 70s it seemed to be the best solution. For the enhancement of the new plastered facades, it was decided to reconstruct the oldest façade painting, dated around 1330. Fig. 11 Regensburg, “Kepler-Haus”, reconstructed façade painting of 1330 ca. 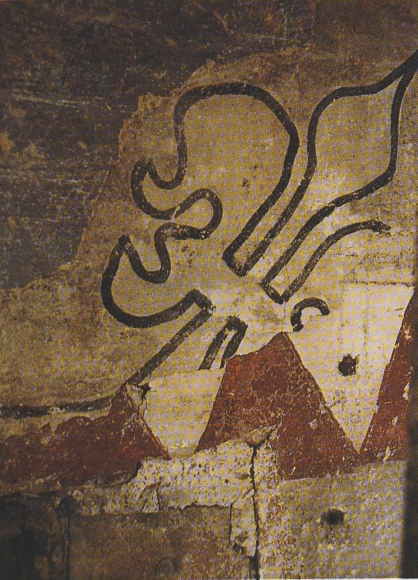 Reconstructed façade painting of 1330 ca., with modern painting materials and techniques, 1970s. Photo: Bayerisches Landesamt für Denkmalpflege, 1990 ca. 19Unfortunately the reconstruction was not done with historic materials and techniques, and the craftsmen executing the job did not have enough empathy to understand fully the aesthetic and manual characteristics of the painting, thus its fineness was partially lost. After a long period of storage and preservation work, the detached historical façade paintings, were transferred onto new supports, reassembled together, and conserved; at present, they are stored in the archive for built heritage of the Bavarian State Office. Façade painting of 1530 ca. detached from the “Kepler-Haus” in Regensburg in the 1970s, transferred on new supports and reassembled together in the 1980s; today preserved in the archive for built heritage of the Bavarian State Office. Photo: Bayerisches Landesamt für Denkmalpflege, 1980s. 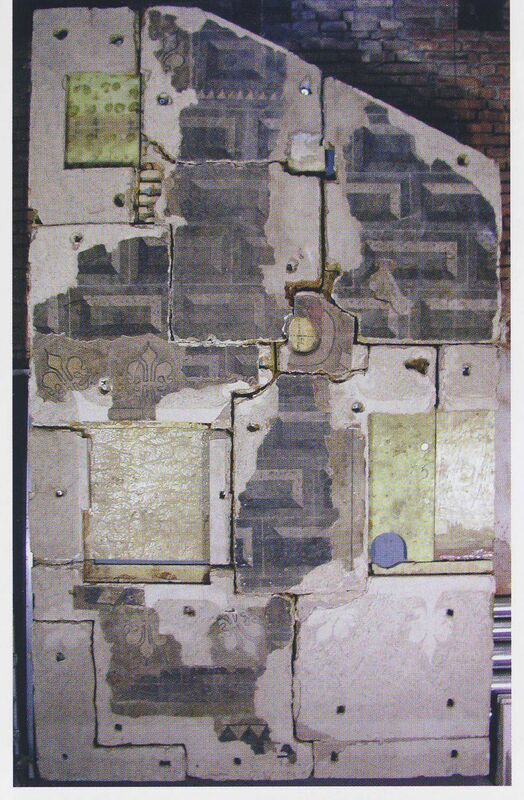 20How reliable were the stratigraphic investigations and the architectural paint research which increasingly gained ground the 1970s? Were the methods and techniques of research and investigation then in force able to inspire confidence? How did interdisciplinary cooperation and communication work between the conservators for wall paintings and architectural surfaces (mostly coming from handicraft trades), and the representatives of the State Offices for the preservation of historical monuments and sites (in general, art historians and architects active in the practice of conservation)? 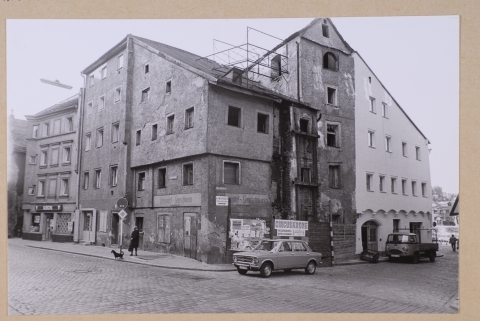 The situation in the 70s of the Bavarian State Office for the Preservation of Historic Monuments and Sites, under the direction of Michael Petzet, exemplifies how the considerable gap between theory and practice could be bridged. Here, the conservation ateliers were expanded with more specialised jobs and better technical equipment. Special departments were created for all tasks highly required in the practice of conservation of built heritage, including research and conservation of wall paintings and architectural surface, historic building research, as well as stone conservation. In this way, specialised State conservators were able to carry out exemplary activities of recording, documentation, conservation and restoration of built heritage, and furthermore offered consultations with free lance conservators in situ, on the scaffoldings, together with the art historians and architects of the Bavarian State Office. 21At that time, the conservator Helmut F. Reichwald was appointed chief conservator of the new department for conservation and restoration of wall paintings and architectural surfaces. 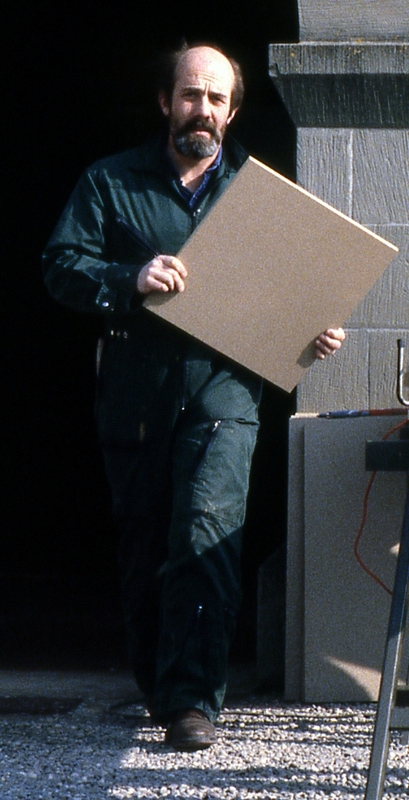 First of all, he wanted to establish an innovative methodology of investigation and documentation, in order to counter the still-ongoing practice of day-to-day damage and destruction of valuable historic material in situ, caused by insufficiently trained craftsmen and site managers and in general by inadequate conservation concepts and wrong decisions in the operative practice of conservation [Reichwald 1982, 17-35]. Helmut F. Reichwald (1937-2014), Chief Conservator of the department for conservation and restoration of wall paintings and architectural surfaces in the Bavarian State Department for the Conservation of Monuments and Sites, in the 1970s. 22The main goal of Reichwald’s methodology was to assure and manage quality conservation work in the field of built heritage preservation. From Reichwald’s point of view, a verifiable scholarly basis was urgently needed for the State Office conservators’ concern with studying the different building phases with their paint, design and decoration, for the purpose of better understanding the monuments and conserving and eventually reconstructing the paint and polychromy. He criticized that those carrying out investigations on paint and decoration had an exclusive eye for studying and uncovering the so-called original surface, while finding it acceptable to destroy later historical phases that are in fact just as interesting and important for the built heritage. The investigation techniques in use on site were often also highly questionable, conducted by mere chance and harmful to the monument. The dubious results of such investigations served as the basis for the reconstruction of the assumed original aspect. In the end, deplorable losses and forgery of the monument were the results. 23Reichwald wanted to establish obligatory recording and documentation on a high level, as precondition for every kind of conservation and restoration. With the standards and accompanying training facilities provided by the State Office atelier, persons active on site could achieve a common qualified operation level, even though their knowledge and experience were very different. 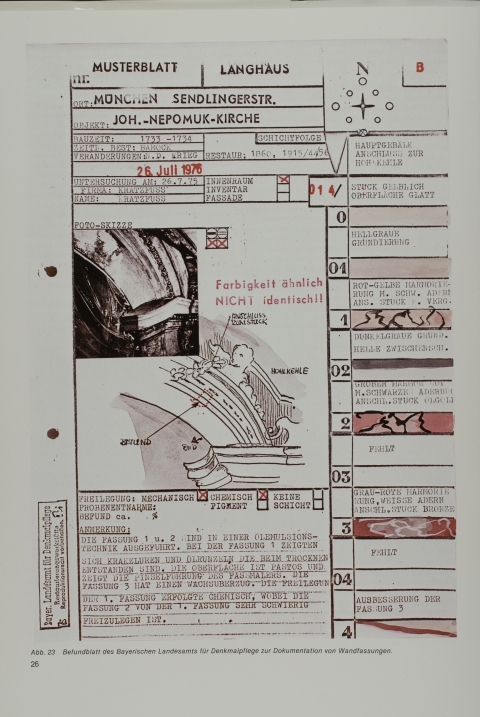 As an alternative to the often poor and unsystematic documentation schemata circulating at that time, Reichwald developed forms which required precise information on the localisation of findings, their stratigraphy, and material and design characteristics. The recording of every single plaster layer or paint layer demanded traceability and logic as well as a clear distinction between description and interpretation. The layout of the forms permitted a side-by-side arrangement of several forms, thus making possible a direct comparison between the stratigraphy of various findings (for example, in an interior or on a façade). In this way, it was easy to visualise and evaluate the paint and design, for example of different architectonic elements for a specific historical phase of a building. 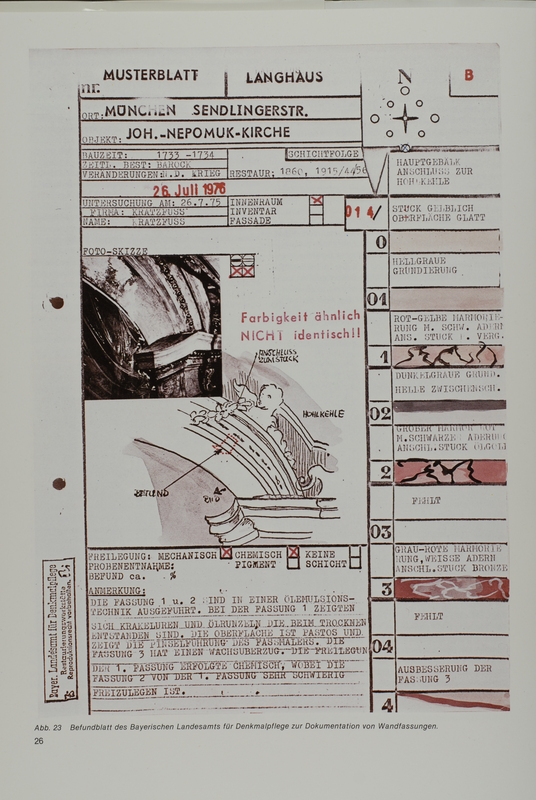 Form for the recording of historical stratigraphies on architectural surfaces, developed by Helmut F. Reichwald in the 1970s for the Bavarian State Office, with an example of a finding in St. Nepomuk church in Munich. Photo: Bayerisches Landesamt für Denkmalpflege, 1980 ca. 24By this means, scholarly-based documentations of architectural paint research could be made available to all professionals active in the preservation of built heritage. 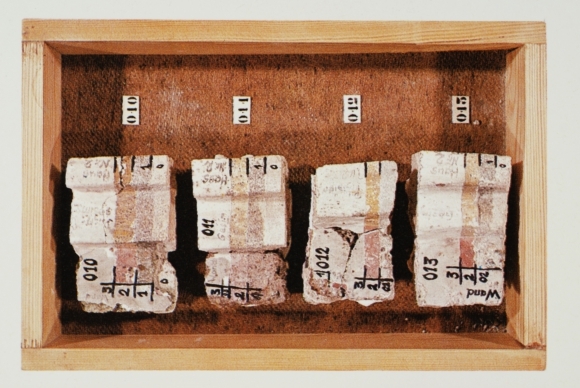 The investigations in situ mostly were connected with taking samples of plaster and paint layers (little cubes in the size of a few cubic centimetres), which could enable others to check the reliability of the performed work. Samples of plaster and paint layers archived as original findings after the investigation of the monument, a method in use in the 1979s-80s in the Bavarian State Office (the samples in the photo removed from a palace of Regensburg). 25This kind of “destructive intervention” is not common any more today, but at that time it was legitimated based on the fact that in many cases these samples were the only original fragments still preserved after the “restoration” of a historical building. In fact, in several cases today we are glad to have the possibility to study these little portions of authentic material. 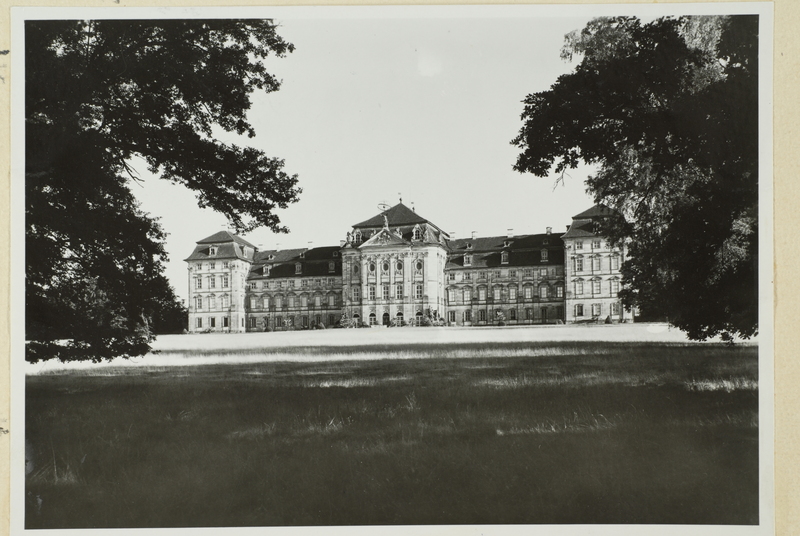 The samples were archived in the Bavarian State Office together with the recordings, photos and documentations of the respective building. Furthermore, Reichwald developed a guideline of best practice – a sort of early and comprehensive “decision-making-model” – depicting step-by-step how conservation should be planned and performed in interdisciplinary cooperation, accompanied by a conservation journal and documented with a final common report. With the demand for a standardised structure, documentations needed to be comprehensible over a long-term view and offer a solid basis for research and for continuous monitoring. In addition, there was also a didactic concern, since a systematic procedure can foster awareness of the complex existence of built heritage and increase empathy for the preservation of this tangible historic document as a whole. 26The positive impact of the methodology developed by Reichwald on the practice of research and conservation in the 70s has been proven thanks to many case studies of successful activities, such as an article on the topic “built heritage and architectural paint” published by Magnus Backes and illustrated with examples from Franconia depicting different conservation concepts on the basis of architectural paint research [Backes 1978, pp. 34-38]. Just to present one example, on the facades of the baroque Castle of Weißenstein in Pommersfelden, important findings related to the original paint of the eighteenth century revealed a yellow ochre paint on the wall areas and white paint on the sculpture decoration. In detail, however, they were not precise enough for a strong reconstruction; so the owner, the professionals involved, and the authorities decided to maintain the traditional stone-faced appearance of the facades even though it was not the original. View of the Façade with the traditional stone-faced appearance, instead of reconstructing the original polychromy because of a lack of findings, in the 1970s. 28What remains today of the upturn and improvement of methodology and operative practice in built heritage preservation developed in the 1970s? Does the increase of public interest in built heritage studies and in the conservation of historic buildings still persist today? Since the turn of the millennium, strong cuts in public expenditure have led to staff cuts in the conservation ateliers of the German State Offices for the preservation of historical monuments and sites, and to a drastic decrease in the promotion of conservation projects. In many German Länder, this negative development has even strengthened with the pro-business amendments that have passed in the last years to the laws for the protection of historic monuments and sites. The democratic spirit of the 70s, which called for the professional preservation of all built heritage (including modest examples of this heritage) has fallen more and more silent. The attention of the general public and of the sponsors today is principally targeted at the conservation of prominent works of art. 29In comparison with the 70s, the methods and techniques of architectural paint research and in general of recording, documentation and conservation of built heritage have dramatically improved and advanced. In contrast to the situation at that time, many young professionals highly qualified in the conservation of cultural heritage are available in Germany just as in all Europe and are eager to put their knowledge into practice. Let us hope that the spirit of the 70s – with its beginning of a new era of public commitment for the preservation of cultural heritage – may, in spite of economic troubles, experience a revival today for the benefit of our society. Backes, Magnus, 1978. „Entdeckungen und Entscheidungen – Fünf Beispiele aus Oberfranken zum Problem ‚Denkmalpflege und Farbe’“, in: Jahrbuch der Bayerischen Denkmalpflege, Bd. 30 für die Jahre1975/76, 25-56. München: Deutscher Kunstverlag. Denkmalpflege 1975. 1975. Dokumentation der Jahrestagung der Vereinigung der Landesdenkmalpfleger in der Bundesrepublik Deutschland, Goslar 15.-20. Juni 1975, Red. HPC Weidner. Hannover: Selbstverlag. Durian-Ress, Saskia. 1975. Klassische Denkmalpflege – Konservieren und Restaurieren von Einzeldenkmälern. In: Petzet, Michael (Red.). 1975. Eine Zukunft für unsere Vergangenheit. Denkmalschutz und Denkmalpflege in der Bundesrepublik Deutschland, Ausstellungskatalog zur Wanderausstellung im Europäischen Denkmalschutzjahr 1975, 115-124. München: Prestel Verlag. Farbige Architektur. Regensburger Bürgerhäuser – Bauforschung und Dokumentation (Arbeitshefte des Bayerischen Landesamtes für Denkmalpflege Nr. 21), 1984. München: Lipp Verlag. Koepf, Hans. 1976. „Die alte österreichische Stadt – morgen“, in: Stadterhaltung – Stadtgestaltung (I), hg. von Hans Koepf, Institut für Baukunst der Technischen Universität Wien, 15-29. Wien: Selbstverlag. Petzet, Michael. 1975. „Denkmalpflege heute“, in: Jahrbuch der Bayerischen Denkmalpflege, Bd. 29 für die Jahre 1972-74, 11-17. München, Berlin: Deutscher Kunstverlag. Ramisch, Hans, 1978. „Nachruf auf Johannes Taubert“, in: Jahrbuch der Bayerischen Denkmalpflege, Bd. 30 für die Jahre 1975/76, 245-247. München, Berlin: Deutscher Kunstverlag. Reichwald, Helmut F. 1982. „Grundlagen wissenschaftlicher Konservierungs- und Restaurierungskonzepte – Hinweise für die Praxis“. In: Kirschbaum, Juliane. Erfassen und Dokumentieren im Denkmalschutz. Dokumentation des Kolloquiums des Deutschen Nationalkomitees für Denkmalschutz, 4.-5. März 1982, Liederhalle Stuttgart (Schriftenreihe des Deutschen Nationalkomitees für Denkmalschutz, Bd. 16), 17-35. Bonn: Selbstverlag. Ress, Anton. 1973. „Zur wiedergewonnenen Farbigkeit historischer Kirchen- und Profanbauten im fränkischen Raum“, in: Jahrbuch der Bayerischen Denkmalpflege, Bd. 28 für die Jahre 1970-71, 195-228. München, Berlin: Deutscher Kunstverlag. Sauerländer, Willibald. 1975. „Erweiterung des Denkmalbegriffs?“, in: Denkmalpflege 1975, Red. HPC Weidner, 187-201. Hannover: Selbstverlag. Schädler-Saub, Ursula. 2015. „Einführung“ in: Schädler-Saub, Ursula/Weyer, Angela: Geteilt – Vereint! Denkmalpflege in Mitteleuropa zur Zeit des Eisernen Vorhangs und heute (ICOMOS Hefte des Deutschen Nationalkomitees LIX), pp. 14-29. Petersberg: Michael Imhof Verlag. Strobel, Richard. 2011. Das Wohnhaus von Johannes Kepler in Regensburg. Rettung – Sanierung – Erforschung (Schriftenreihe des Bayerischen Landesamtes für Denkmalpflege Nr. 3), München: Volk Verlag. Taubert, Johannes. 1975. „Die Aufgabe der Restaurierungswerkstätten“, in: Petzet, Michael (Red.). 1975. Eine Zukunft für unsere Vergangenheit. Denkmalschutz und Denkmalpflege in der Bundesrepublik Deutschland, Ausstellungskatalog zur Wanderausstellung im Europäischen Denkmalschutzjahr 1975, 125-132. München: Prestel Verlag. Taubert, Johannes. 1978. Farbige Skulptur. Bedeutung – Fassung – Restaurierung, ed. Callwey, München. 1 The Academy of Fine Arts in Stuttgart had offered diploma study courses in conservation and restoration since 1976, but not in the fields of particular interest for heritage preservation, namely in stone conservation and conservation of wall paintings and architectural surfaces. For these areas, diploma study courses were founded at the Universities of Applied Sciences and Arts in Cologne (in 1986) and in Hildesheim (1987). In the former German Democratic Republic, it was a groundbreaking achievement that a diploma study course in conservation and restoration of wall painting and architectural paint had already been founded in 1982 at the University of Fine Arts in Dresden. 2 For this kind of stratigraphic investigation and research, the term in use in Germany is “Befunduntersuchung“ or “Befundsicherung”. The term and concept are not identical with “architectural paint research” used in the UK. The aim of “Befunduntersuchung” is to contribute to a comprehensive understanding of the monument, in cooperation with the historical building research (“Bauforschung”) and the historical and artistic research, and to establish in this way a strong basis for conservation and restoration. In the following text, for the purpose of readability, I use the English term “architectural paint research” with the meaning of the German “Befunduntersuchung” or “Befundsicherung”, keeping in mind that in European practice they are not synonyms.